Hot Improv Tuesday | The Fictionals Comedy Co.
Hey Improv & Spoken Word fans! 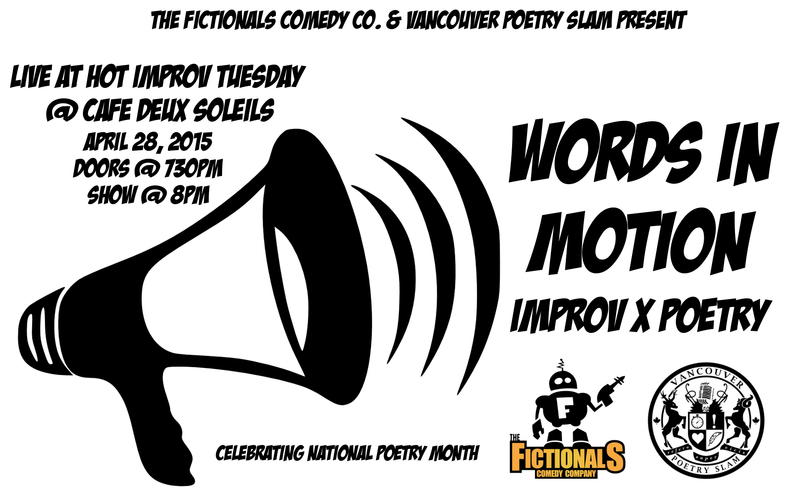 The Fictionals are celebrating National Poetry Month on Tuesday, April 28th with a rendition of Words In Motion, our Improv x Poetry showcase live at Hot Improv Tuesday! We’re teaming up with three talented poets from Vancouver Poetry Slam for an evening of Comedy inspired by Poetry inspired by Comedy! The Fictionals will be trying our hand at wordsmithing, while the poets will come up onstage to try out their improv skills! It’s going to be a crazy night so come on down for some literary laughs! Tickets just $7 / $5 for students and poets. More info on Hot Improv Tuesday via the official Facebook Event.